It’s funny how drastically different this spring season is compared to last year’s. We enjoyed such a mild winter and early spring last year, we were able to get a lot done. The only reason we waited until May 2 to plant our tomatoes last year was because we hadn’t yet acquired the land for them. This year has been so cold and wet that a lot of things have been delayed. 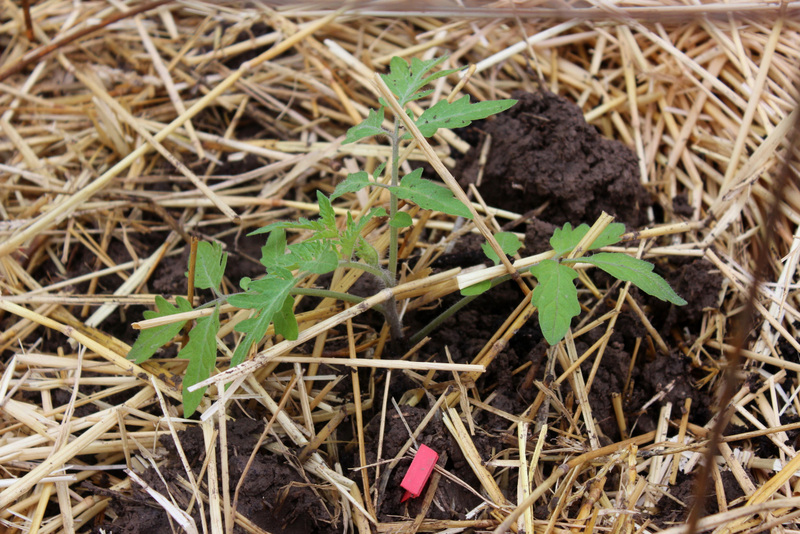 We finished planting our tomatoes in Sunset Hills on April 28. However, this may still have been too early; we’ve also since planted some at Iowa Ave. and they seem to be faring better. 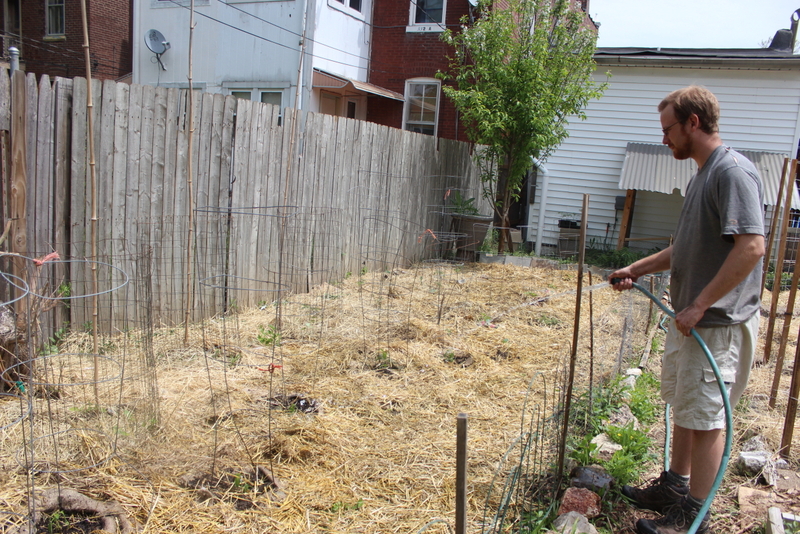 Along with tomatoes in the back section of our Iowa Ave. garden we also transplanted some pepper plants last week. 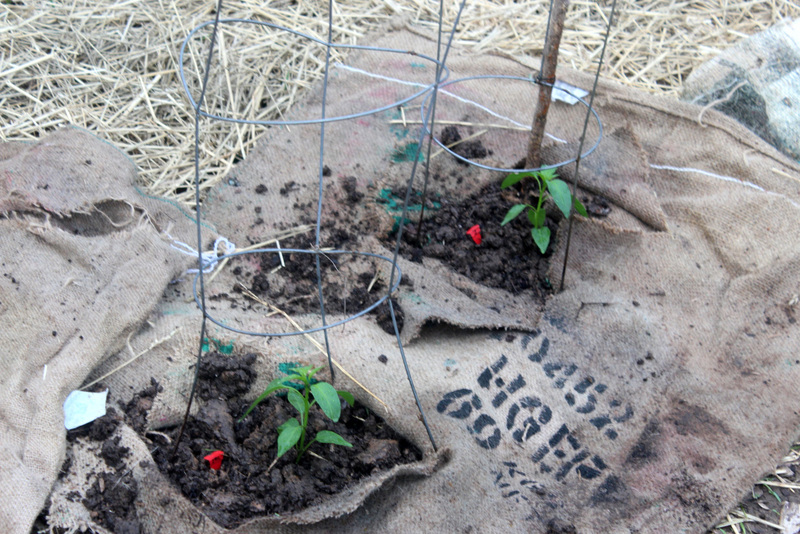 Because of the invasive grass, we planted the peppers in holes we cut through burlap coffee bags and lined all the paths between plants with burlap and straw. Here’s the whole back section, complete with burlap and straw. Between the peppers and tomatoes we planted parsley, nasturtium, thyme, and other herbs. We also started a new tomato container garden in the section by the west fence where we were growing nothing but tall grass and weeds. 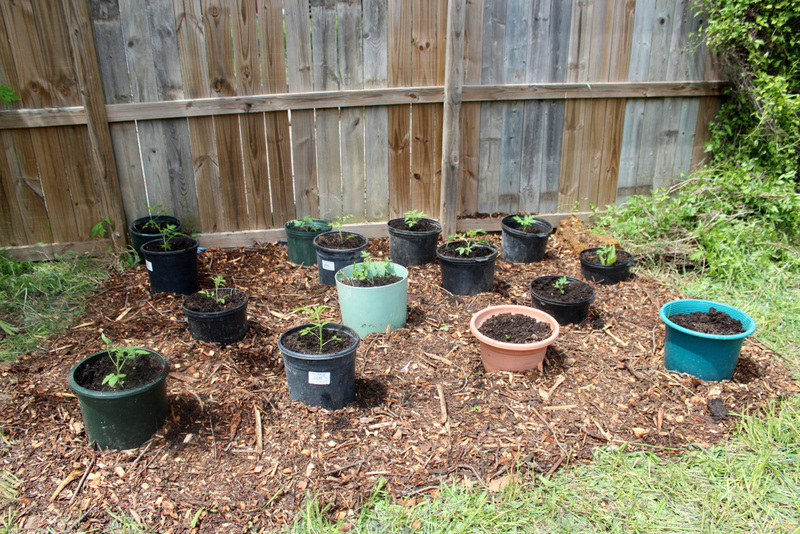 To keep the grass out, we laid out a tarp and plastic sheeting before placing the pots and topping with wood chips. This method worked well for us in a different section last year. 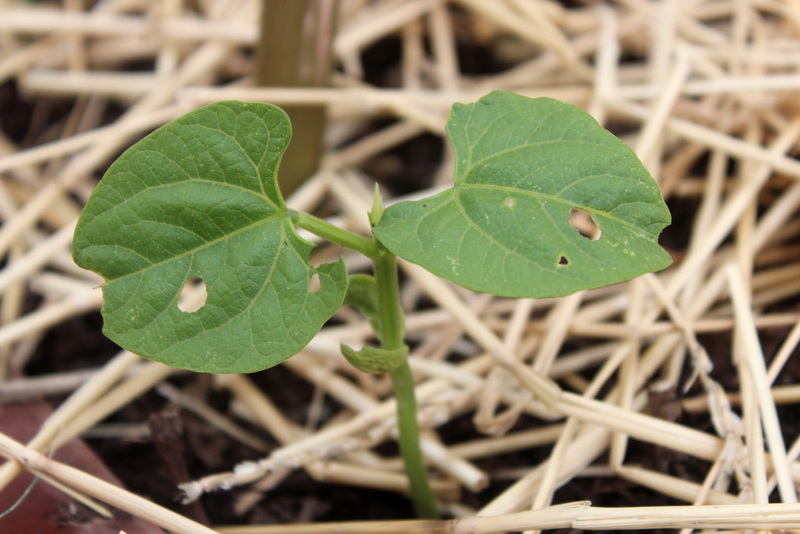 Besides dealing with the terrible grass, we’ve also found evidence of pest damage to some of our newly-sprouted bean plants (above is an Italian pole bean seedling). It happens every year, the beans and peppers are the first to be eaten. We’ve used Dawn dish soap in the past but this year I got some Dr. Bronner’s castile soap- more natural. Mixed with water, I’ve been spraying the tops and bottoms of the leaves and stems of all of our bean plants, and the damage has been limited. 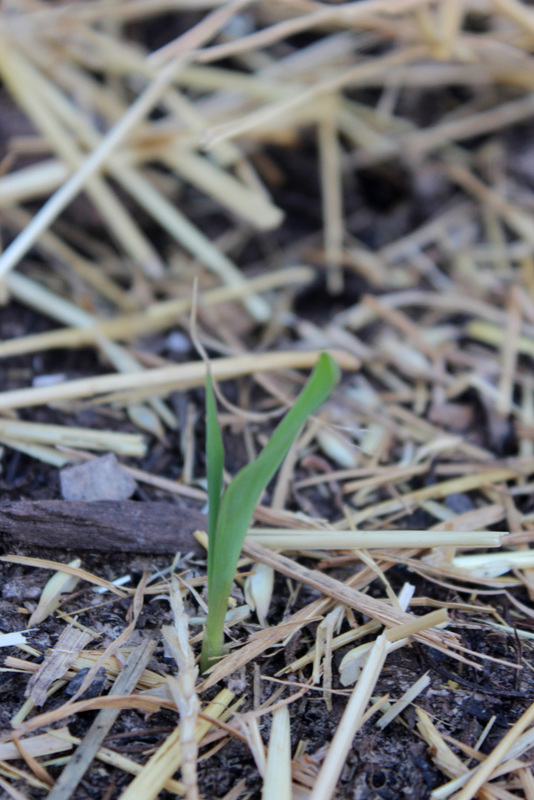 Some of the popcorn we planted sprouted, but not all of it. We want to make sure it grows close together enough for sufficient pollination, so we reseeded some of the areas where germination was low. We have two new raised beds at Iowa Ave. (as seen in our garden outline) this year. 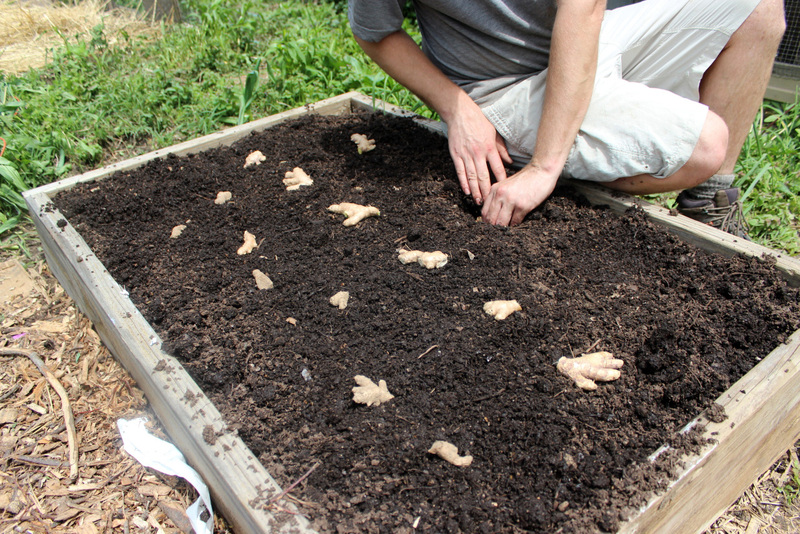 I planted horseradish, mustard, and kale in one, and Eric planted ginger (pictured above) in the other. We grew ginger last year in our side yard after sprouting it in shallow pots first. This year we direct seeded- the smaller pieces are our ginger from last year, the bigger pieces are organic ginger from Local Harvest. The other thing keeping us busy this spring is setting up a new garden space at Eric’s sister’s new house. 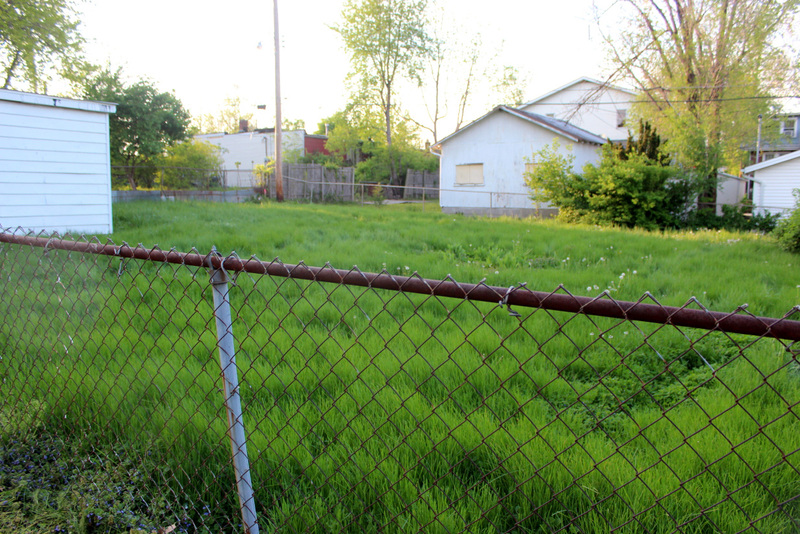 She found a house in the city with a 1/4 acre lot, and she’s letting us farm it (thanks Amy!). We tilled up this section of her yard literally the same day she closed on the house, May 1. We called on our Sunset Hills gardening buddy, Tom, to till the area. It was just too much space for our little walk-behind tiller. 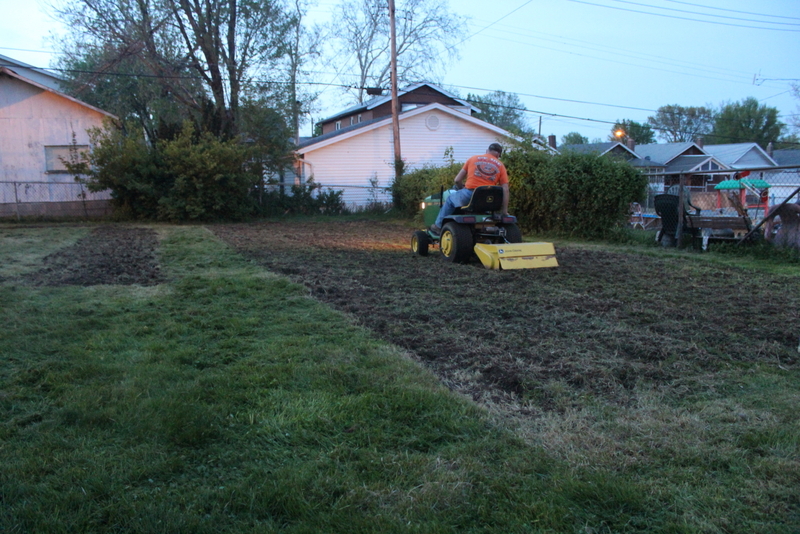 After several hours, Tom had mowed the overgrown grass and tilled up these two big sections for us. Unfortunately we were losing daylight, so he was only able to pass over each area once with the tiller. 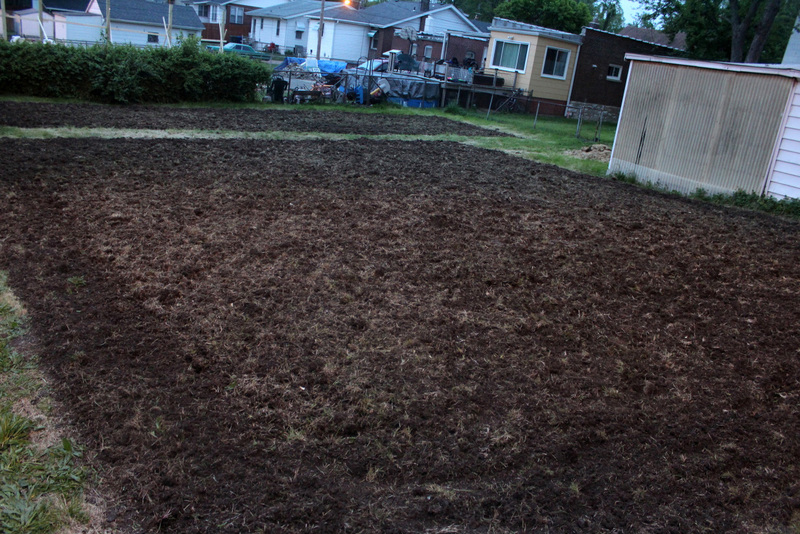 To really remove all the grass, we needed it tilled again. Of course it rained for the next four days straight, so it took a week before Tom was able to come out to finish the job. 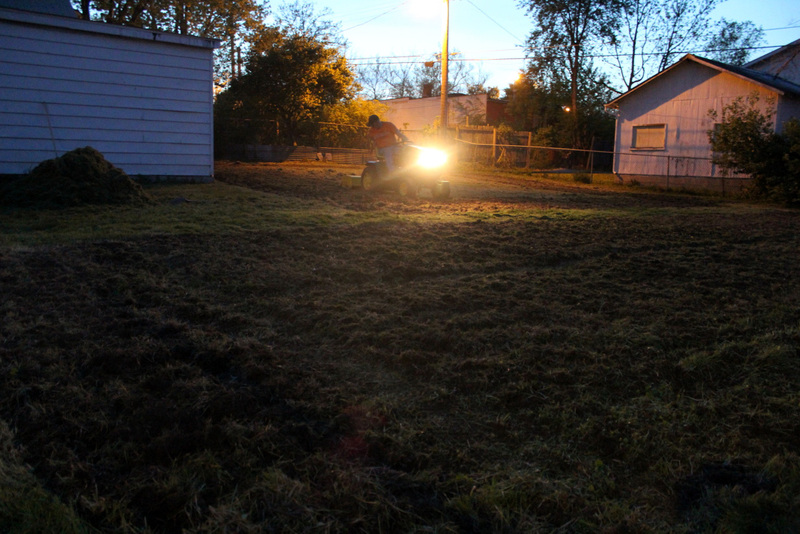 As he tilled we worked to pull out grass clumps, and we returned yesterday to continue pulling them out. Here’s a view from the other side of the yard. In this big section we’ll grow sweet potatoes, squash (summer and winter), pumpkins, melons, and whatever else we can fit. Today I applied some fertilizer and crushed gypsum to the longer, thinner section where we’ll plant tomatoes, then covered with a layer of free compost. Eric is planning to return tomorrow with our little tiller to work the compost in and space out our mounded rows, then plant tomatoes and peppers! We’re also hoping to install a drip irrigation system to help with watering. The weather has really forced us to be super productive in the short periods of time between rain. The forecast for this coming week looks pretty clear, thankfully. Lots of work ahead of us!